My "Lucky Charm Cupcake" painting and "Irish Coffee Cupcake" painting sold last night. 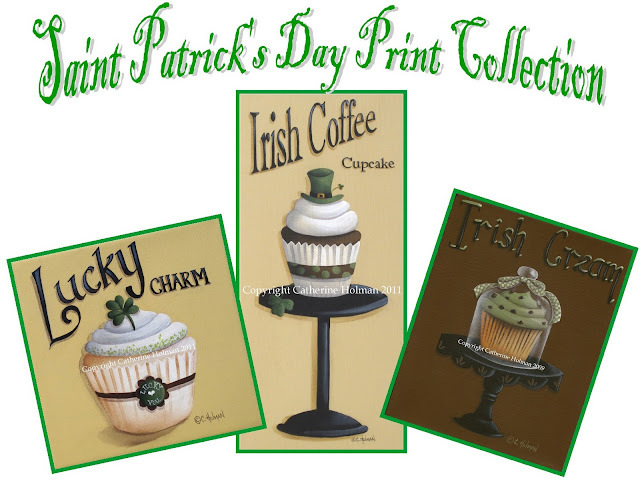 All three designs including last year's "Irish Cream Cupcake" are now available as prints. You can find them in my Etsy and Ebay stores. I'll be starting some Easter cupcake paintings soon! Leave me your cupcake suggestions in my comments. I'm linking up with Kathleen's St. Patrick's Day Blog Crawl. Oh that's a good feeling to have sold all three. Cool and congrats! Easter brings to mind all the usual things: rabbits, Easter eggs, chickies, ducklings, green grass, tulips, daffodils, stained glass windows, jelly beans, and best of all, though I'm quite sure I don't know how one would portray it on a cupcake ;>, the open tomb. Cathie, your prints just give me a wonderful feeling! These look so yummy! Hi hi the irish cupcakes are sucha clever idea. Ilove the irish coffee cupcake with the little hat. Hi Catherine! Your work is adorable, love the Irish cupcakes. Thanks for linking up to my blog party! They are all great but I especially like the Irish Cream. I visited your etsy shop just a few minutes ago and will be back later today to make a purchase. It was so hard to limit myself to just one but the one I selected fits me to a "T" as they say. I love the Irish cupcake! These are too cute and congratulations on selling all of them!